Happy Wednesday friends! We're officially in the homestretch for the weekend and spring has officially sprung! At least here in Florida. In fact, if it wasn't for the humidity being fairly low and it still being cooler at night, I'd say we skipped straight from spring and went into summer. It was in the low 90's over the weekend and today's high is 94 so I'm already breaking out the clothing that's going to keep me comfortable on a scorching day. This maxi is definitely perfect for the spring and summer temperatures! I'm all about maxis, especially during spring because not only are they crazy cute but they're extremely versatile and easy. I'm all about easy and effortless outfits that you can just throw on and feel put together.My favorite part about maxi dresses is they're perfect for date night out or brunch with the girls and this smocked off the shoulder one is so easily dressed up or down! I'm pretty picky when it comes to my floral prints, being as short as I am, I feel like some floral prints can make me look like a little kid so I love that this one is whimsical and the blush and olive on the black makes it feel a bit more mature without looking like your grandmother's comforter which, let's be real, no one wants to look like! 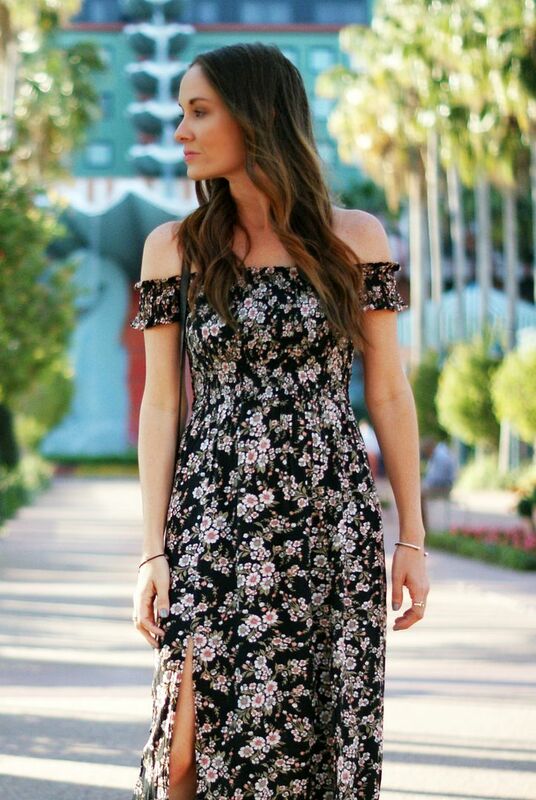 Loving the off the shoulder and the slit--makes it more unique than just any other maxi! The perfect dress for FL! I love how airy it is and the off the shoulder is gorgeous! Love this look babe. I was thinking that here is Georgia yesterday, did we just skip spring? The humidity is creeping in, and my car was suffocatingly hot yesterday. Although today we are expecting storms, and then hopefully back to the sunshine! I cannot believe you've already hit the 90s! It was 80 here yesterday and I was dying haha! 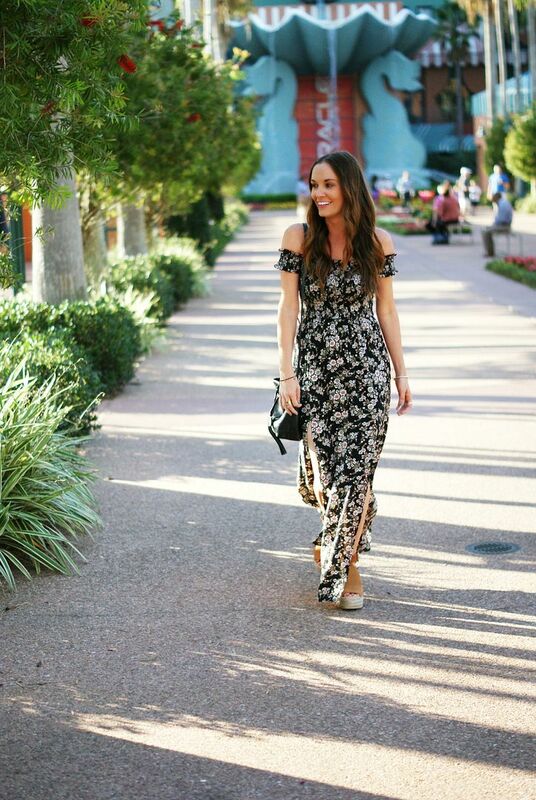 This floral maxi dress is so perfect for the warmer temperatures -- I love the OTS style and the slit! So cute! This maxi is SO stunning on you! I absolutely love the dark floral print and the little OTS sleeves! Spring perfection! Such a gorgeous dress! The sleeves are the cutest. I've been seeing so many dresses in this style and love it! This one is priced so well too! Loving everything about this dress-- you really can't go wrong with a floral print! Hopefully it cools down a little bit for you guys. Girl! You are killing it lately! I have been on the hunt for a cute summer maxi and this may be it. You look gorgeous! You look so pretty! Perfect floral print on you. You look amazing in this maxi floral dress. Maxis are my love language! Totally agree about floral prints but this one looks perfect on you! I welcome you to stop by my blog as well. I also run a linkup on Thursdays so welcome by tomorrow and linkup with me. Happy Hump Day! This maxi is so amazing and looks SO good on you!! Such a pretty maxi dress, you look amazing! So boho-chic! So pretty! This looks gorg on you! Can you believe how hot it got (and how fast)??! It's crazy! I'm loving this pretty dress on you- you look so glamorous!! Pretty girl!! I hear you on maxis and being short haha, it's a fine line to walk! How tall are you?? I'm excited to bust out all my maxis this Spring. 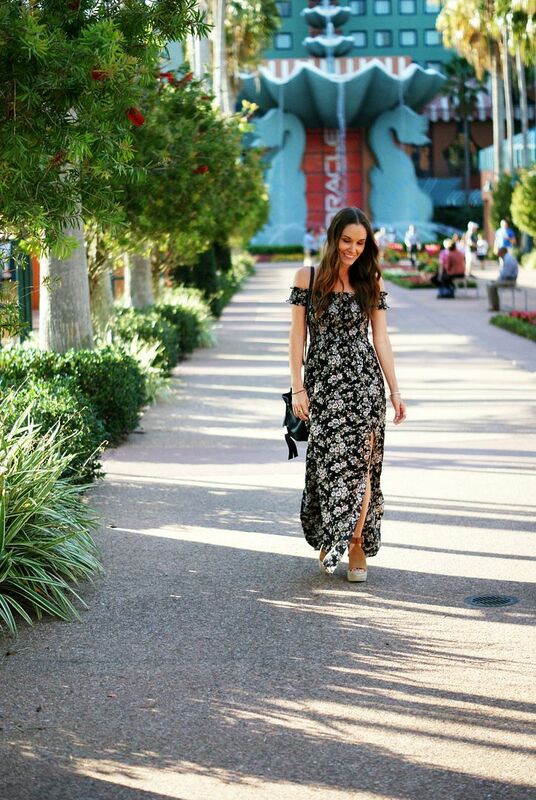 You+this maxi dress= gorgeousness! I love it! Love the off the shoulder and slits, breaks up the maxi so you can wear it in this heat! I love maxi dresses in the spring and summer too because you can feel so fancy without really doing much of anything! I especially love the off the shoulder sleeves on this dress! Love the off-the-shoulder look on you and I'm a fan of the slits on the side to make this maxi airy and comfortable with the warm weather! You look absolutely gorgeous in this floral maxi dress!! I'm so excited for spring and summer to make its way up to New England so I can also start wearing cute dresses like yours! that dress is so so pretty! you're so lucky with the weather then because right now here in Canada we have rain and cold weather and tomorrow is set to snow....haha the most confusing spring weather. Anytime I read your posts, I want to move to Florida and also go to Disney, lol. But, the heat y'all have is no joke! A breezy maxi is a must! Love your dress, the print is perfect! I struggle with those small, child like tendencies too, haha. Obsessed with this dress! You look gorgeous! What a lovely dress that is! The floral print and the slits are just too pretty!